Turbo frother for steaming Milk. On 50% clearance sale until sold out. 30 pcs. left. This 83 mm long frother replaces the narrow old frothers. This frother is easy to clean by flushing steam through for 5 to 10 seconds to flush milk out, & easy to re-assemble. 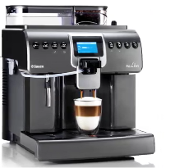 Used in all Saeco, Gaggia, Spidem, Solis, automatic & semi-automatic espresso machines Vienna, Magic & Royal line machines.